Ms Thornton had no idea she had been nominated for the award and was lured to the Otaki Library supposedly to rescue an injured greyhound! What she did find was a surprise morning tea and award presentation, in her honour! There is a core staff of 15 volunteers and dog walkers, too. 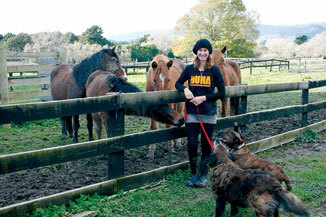 Huha – Helping You Help Animals, has two shelters, the original one in Kaitoke north of Upper Hutt, and the Otaki shelter at the Ashford Park stables, where they have been based for three years. Working with animals has always been part of her life, as veterinary nurse including running a cattery and boarding kennels, she volunteered with the SPCA, and has worked for an animal charity in Thailand. They’re currently caring for 55 dogs, including eight pups which are almost ready for rehoming, 10 cats and 10 horses. The dogs are housed in the former horse stables so each has a large area, complete with either a double or single bed which is made up each morning. Most cats are “boarded” with volunteers. All the domestic animals are rehabilitated, desexed, fully vaccinated and micro-chipped and vet checked before being rehomed. While many of their dogs have been surrendered by the owner, they take a lot of dogs from the pounds at Wellington, Hutt and Levin; “death row” dogs are only taken if they suitable for rehoming. All funding is through donations and proceeds from the opportunity shop Eva’s Attic in Arthur Street.